An Army at Dawn brings the Panzer Grenadier game series to Tunisia in 1942 and 1943, with 40 scenarios mostly based on American battles with the Germans and to a lesser extent with the Italians. The British also make a token appearance. What’s missing are the myriad of French forces that also saw action in the campaign (many of them on both sides): the Army of Africa, the Foreign Legion, the Moroccan Goums. Plus the pro-German Phalange Africaine. 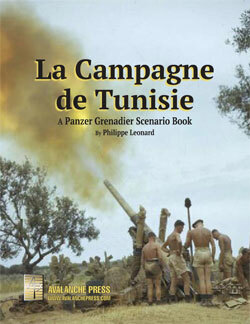 Philippe Léonard added them all in La Campagne de Tunisie, our expansion book for An Army at Dawn (you’ll need a map from either Conquest of Ethiopia or Africa Orientale Italiana, too). He also designed a dozen historical scenarios based on the battles of French troops in the North African campaign, and gave them a great deal of background depth. Let’s take a look at the first section. The Allied command hoped that by using primarily American forces to land in Morocco and Algeria, the Vichy French would be willing to let the landings occur with little to no resistance. Preliminary contact with Vichy officials through Operation Flagpole seemed to indicate that such an expectation was realistic. Of course some guns would be fired in order to show the Germans that the French had not “changed sides” but no French forces would do much of anything to resist. This message was not uniformly distributed to the units in the field, however. There was a great deal of confusion over who, amongst the French command, was really in charge and who favored an Allied invasion. Indeed the choice of Henri Giraud to be the liaison between the Allied command and French officials did not sit uniformly well with the French. The result was that, in spots, the French defense was quite spirited, much to the consternation of the American commanders. The French Army of Africa had been reduced through the Armistice with Germany to a total of 125,000 men who would be charged with the defense of French Northwest Africa (Morocco with 60,000 men, Algeria with 50,000 men and Tunisia with 15,000 men). General Maxime Weygand had cooked the books, however, and had added another 60,000 men as police auxiliaries who were, in fact, reserves for the Army of Africa. Some of the men defending North Africa had fought the Germans in France in 1940 at Gembloux, as part of the First French Army, where they had brought the German armored forces to a halt. Losses elsewhere and the breakthrough at Sedan forced the French retreat, not a failure of the Moroccans and Algerians fighting in Belgium. The Army of Africa was somewhat liberalized in comparison to other European Colonial forces. Indigenous officers could rise to the rank of Capitaine and as such would be given significant responsibility. This stands in stark contrast to the British or Italian practices of providing all officers from the European ranks. We can imagine our Moroccan Capitaines, Lieutenants and Sous-Lieutenants watching the American landings, complete with flag carriers, and commenting on the lack of professionalism of these green forces. The Army of Africa put up relatively indifferent resistance in comparison to the French Navy which was overwhelmed after quite spirited, and in some cases suicidal, resistance. The battleship Jean Bart, under construction in Casablanca, continued to fire its single operational gun until pummeled into submission by Allied warships. On the second day of Operation Torch, Lt. Robert Whitsit’s platoon from B Company of the 701st Tank Destroyer Battalion was ordered to accompany a company of light tanks moving east to stop a Vichy column of 14 D1 tanks reported moving up the road from Sidi bel Abbes, the Foreign Legion center. The initial effect of this threat was to stop the northward movement from Tafaraoui by most of the Red flying column which had just started its march to La Sénia. French artillery fire from the hills west of Tafaraoui had already delayed these troops at a road junction directly north of the airfield when they received word of the approaching French armored force. The French tanks assembled in the vicinity of St. Lucien while the Americans organized an attack to drive them off. The tank destroyers laid down a base of fire from a hill about 800 yards from St. Lucien while the tanks advanced with two platoons abreast and a third 500 yards behind them. The French force was driven from the field leaving fourteen ruined D1 Renault tanks behind. The American force, which had lost one man, one tank, and one half-track, held St. Lucien until relieved that night. French armored intervention had failed to regain Tafaraoui airfield, but by catching the Americans without reserves, had upset the advance on La Sénia airfield and Oran from the south. La Sénia airfield was not seized until 1000, 9 November, after many airplanes had already flown off, presumably to French Morocco. We start out with a tank battle, between pretty crapulent tanks (French D1 medium tanks against American Stuarts) in a restricted battlefield that will force a confrontation. The French also get a company of the Foreign Legion, so right away we break out the gonzo pieces. Maj. Gen. Lucian K. Truscott, commanding American forces engaged in Operation Goalpost, the landings at Port Lyautey, worried about a potential French counterattack against his southern flank. If the French armor broke through the small defending force, it could disrupt the entire attack. If the 1st Battalion of Truscott’s 60th Regimental Combat Team could be struck in the rear and scattered, then Blue Beach might be wrested from its occupants. Truscott sent seven light tanks to block the Rabat-Port-Lyautey highway. The tank radios had been corroded by the salt air, and their 37mm guns had not been re-sighted after landing. Still, they took positions astride the highway southeast of the lagoon as the first gray light of a cold morning appeared. What followed was the first tank engagement in Morocco. The American light tanks drove off a company of French infantry in positions in the woods and near a farm across the road. About half an hour later, some fourteen to eighteen Renault R35 tanks and approximately two battalions of infantry came into view, approaching along the road from Rabat. The American tanks thereupon withdrew behind a slight rise which offered some protection and opened fire on the column. The answering French fire could not pierce the Stuarts’ frontal armor, while the American tankers destroyed four French tanks, inflicted severe losses among the French infantry, and stopped the thrust. Accurate gunfire from the cruiser Savannah forced the French to break off the attack and temporarily withdraw. Truscott sent more tanks and anti-tank guns to help repulse a second French attack at about 0900. At the one place where that French armor appeared in force, fortune dictated that the handful US light tanks were just enough to deal with them. This is another relatively small scenario, featuring another small tank battle between crapulent tanks: this time the French have a couple of companies of Renault R35 tanks, and the Americans counter with Stuart light tanks. They also have naval gunfire support, in what’s going to be a tough fight for the French. And that’s all in the first section, just two scenarios as the French fight the Americans. In the next segment, they’ll switch sides and take a lot of their friends with them.